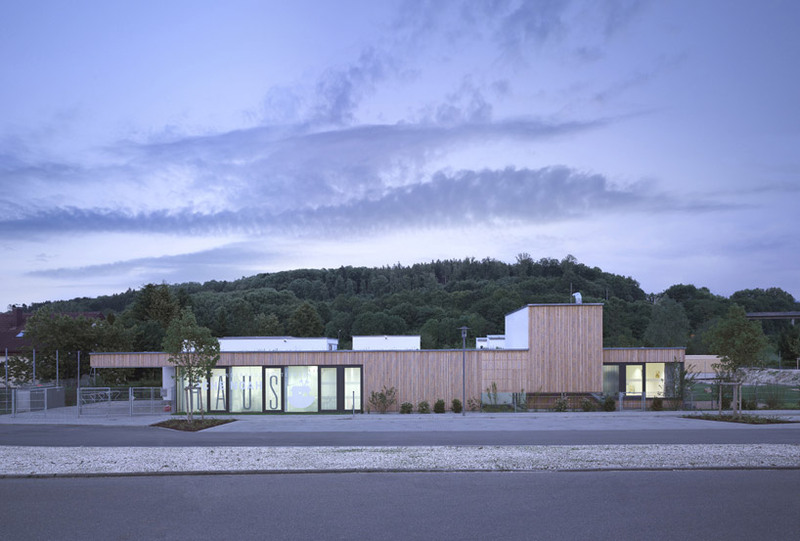 german practice liebel architekten has recently completed ‘kinderhaus arche noah’, a kindergarten school in hüttlingen, germany. created with its young building users in mind, the facility features child-friendly design. the proportions have been reduced as well as low placement of ribbon windows and doors to maximize views from their perspectives. floor to ceiling glazing, skylights and atrium spaces flood the group areas with natural light. incisions dividing the building to offer outward views while classrooms are arranged around a central outdoor courtyard introducing additional illumination and access to fresh air. inside, a vivid color palette has been used to aid with orientation for the children as well as producing mood lighting. addressing sustainability and economy, the compact structure features high insulation, ensuring minimal energy loss ensuring low consumption. heated with a water pump, an underfloor heating system is used throughout the interior, generating a comfortable play environment. the ventilation system recirculates the warm air, further minimizing energy consumption.